This week in Part 2 of my series on beer pumps, I review the new Blichmann RipTide Pump. Last week in Part 1 I covered general brewing pump features as well as the popular March and Chugger pumps. While the March and Chugger pumps covered in Part 1 have been the workhorses of homebrewers for many years now, Blichmann Engineering recently launched a new beer pump called the Riptide specifically designed to address home brewer’s needs. It has some unique features I really like. I was lucky enough to get a hold of a new RipTide and brew with it recently, so here’s my review of it. Enclosed Motor – Other designs have an open motor design, meaning that the motor is exposed and can be quite loud. The RipTide has a fully enclosed motor which makes it extremely quiet – in fact almost silent when operating. Also the enclosed motor means you don’t need to worry as much about spilling water or wort on it accidentally while brewing. Easy to Disassemble and Clean – The RipTide not only has an easy to clean magnetic-drive stainless steel head as a standard feature, but the entire head is held together with a single large Tri-Clamp. It takes literally seconds to remove the triclamp and disassemble the head after brewing for cleaning. Most other pumps require removing several screws to take the head off. The precision valve is also easy to remove and clean. Blichmann Linear Flow Valve Built In- For other pumps you need to add a separate ball valve to the output to control the flow of wort, and unfortunately the ball valve rarely offers the precision flow control needed when pumping through a plate chiller. The RipTide has an integrated linear flow valve that takes about three turns to fully open/close so you can very precisely adjust the flow rate when pumping your wort through a chiller. Integrated Bleed Valve – Other pumps typically need a separate bleed valve on the input to allow the pump to be primed properly as they won’t operate without liquid in the line and pump. 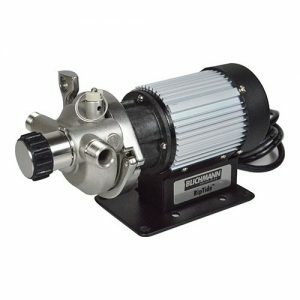 The Blichmann pump has a “keg style” air release valve built into the head, so all you need to do to prime the pump is pull the ring on the bleed valve. Built In Switch – Its a little thing, but most other pumps don’t have a switch built in so you need to either install an external switch or pull the plug to turn other pumps on and off. The RipTide has a built in switch and 10 foot (roughly 3 m) cord. NPT Fittings you can Rotate with the Head – The pump comes with standard 1/2″ NPT fittings aligned 180 degrees from each other and you can rotate the head to support different orientations. Since the RipTide has the same fittings as my standard March pump it was pretty easy to install on my existing BrewEasy system. Priming the pump was very easy using the bleed valve. Also the peak flow rate is the same as my existing pump. The first thing I noticed when operating the pump is just how quiet it is – the Riptide is listed at -50 db and it really is pretty close to silent when you operate it. Since I have an electric system, brewing with the Riptide is almost a silent experience except for a bit of noise from the wort itself recirculating into the top of the mash tun. The precision valve came in handy when recirculating the mash. Where my old ball valve was generally either open or closed, with the Riptide I could dial the flow rate in so it would recirculate at a steady rate without running the mash tun dry. Precision flow control was even more important when chilling wort through my plate chiller. I really struggled on my old pump to get the ball valve in just the right place to hit my target fermentation temperature. With the Riptide I could make very small adjustments and really dial in the temperature coming out of my plate chiller precisely. After brewing cleanup was a snap as it only takes seconds to open up the pump head and remove the valve and the parts are stainless steel. I just disassembled the head, cleaned it with my other brewing tools and reassembled after drying. With a list price of $200 (as of this writing), I think Blichmann has a winner here. The RipTide is only slightly more expensive than a comparable stainless steel head March pump, and when you factor in the built-in features including the fully enclosed motor, built in precision valve, quick disassembly, and built in bleed valve it is a great deal. Also the enclosed motor makes it much quieter than any other pump on the market at this time. I hope you enjoyed my two part review of beer brewing pumps. If you missed it you can find part 1 on March and Chugger pumps here. Thanks for joining me on the BeerSmith Home Brewing Blog. Be sure to sign up for my newsletter or my podcast (also on itunes…and youtube…and streaming radio station) for more great tips on homebrewing. Also check out the How to Brew Video series I shot with John Palmer if you want to learn more about all grain brewing. Fantastic web site. A lot of useful info here. I am sending it to some pals ans additionally sharing in delicious. And certainly, thanks to your sweat! I have had a March pump for years and thought I’d give one of these a shot when I wanted a second pump for my setup. The flow is 5gpm, if I remember correctly, but I can’t really tell a difference in practical use between it and my March in flow. It does seem to prime easier and it is ridiculously quiet in comparison. I have not had a chance to use or see the Blichmann in person, so I can’t speak to that one personally. One thing to note on the Blichman Riptide: The bleed valve is the same bleed valve found on Corny kegs. The issue with this is that when you pull the pin on top to bleed the wort pump, hot wort will spray out the sides once primed and go all over the place, you have to be quick to release the valve as soon as it’s primed. 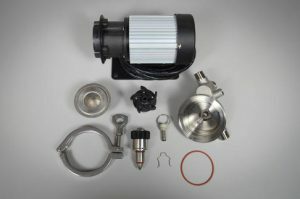 The flow rates are shown here for the pump: https://www.blichmannengineering.com/products/riptide-brewing-pump – Click on the data page. If you know the head pressure (how much you are lifting the wort when pumping) you can get the flow rate and calculate how long it takes to move your volume.